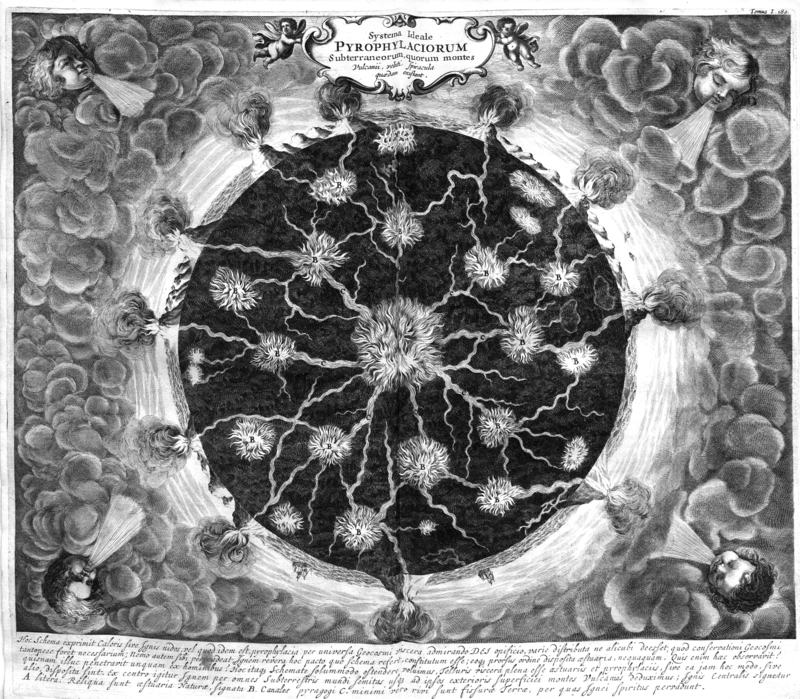 Image from Athanasius Kircher’s Mundus Subterraneus (1678 edn.) vol. 1, p. 194. In the beginning, create the heaven and the earth. Everything should be in a state of chaos. Then, let there be light. Light will bring the world into sight by causing the formless abyss to sort itself out. Over a period of six days, let the sun, the moon, and the planets coalesce like bubbles, as celestial and terrestrial matter separate; on earth, concentric layers of air, water, and dry land will arise around a pulsing core of fire. In the process, bring forth minerals, plants, and animals. This is good, but not good enough. If the primordial light is left unchecked, all mixed and organic bodies will soon break down and dissolve into their elementary constituents; even beings endowed with seeds will stop propagating their kind. To prevent the cosmos from congealing, add Man to the mixture. Let him stir it, and it will be very good. A caricature of Louis-Bertrand Castel’s “ocular organ” by Charles Germain de Saint Aubin (1721-1786). The physics treatise that inspires my thought experiment appeared in 1724, when the boundaries between physical, chemical, and spiritual processes were still porous. 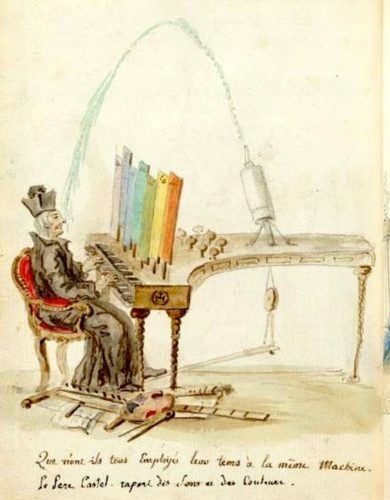 Its author was the French Jesuit mathematician and natural philosopher Louis-Bertrand Castel (1688-1757), best remembered today for his ocular harpsichord (a musical instrument that played colors) and his quarrels with the likes of Voltaire and Rousseau. To be clear, Castel did not couch his interpretation of Genesis in culinary terms; but he did argue that God’s primordial “light” must refer to the fundamental, mechanical principle of nature, the force causing elementary particles to weigh against one another and to regroup according to their kind — like mercury, water, and oil mixed together end up settling into layers. What Moses called “light,” ancient philosophers like Empedocles, Parmenides, and Epicurus had known confusedly as “love and strife”, “sympathies and antipathies,” “attractions and repulsions.” Since Newton, moderns recognized it as “universal gravitation” — or as Castel would have it, “universal weighing” (pesanteur). Natural philosophy, just like the original chaos, was sorting itself out. Yet universal weighing could only be half the story. Castel’s main contribution to science, as he saw it, was to demonstrate the need for another principle: a universal lightness, a kind of spiritual leaven or ferment that would counter the weight of nature and sprinkle a little chaos into the world’s regular march toward equilibrium. This principle had to be spiritual, as opposed to mechanical, because a constant mechanical counterweight would cancel out rather than interrupt the course of nature as needed. Now, God could intervene directly to do just that, but that would be beneath His dignity. A popular alternative — giving nature its own spiritual, vital powers — raised the specter of materialism; out of question for a Jesuit. Castel’s solution? God must have delegated the task of disrupting the world to Man, his troublesome steward. Endowed with free will, humans could bring about everything universal pesanteur could not. Local trouble, Castel reckoned, added up to all the meteorological, climatic, and geological changes needed to prevent the world from grinding to a halt and freezing over. While this might seem to be a recipe for disaster, Castel trusted that God knew what He was doing. The curse of mortality, for one, ensured humans would not slack off, nor overreach their bounds. Since the Fall, Adam and his descendants felt the weight of nature; they had to sweat and toil to delay the hour of their death (death by gravity, that is). 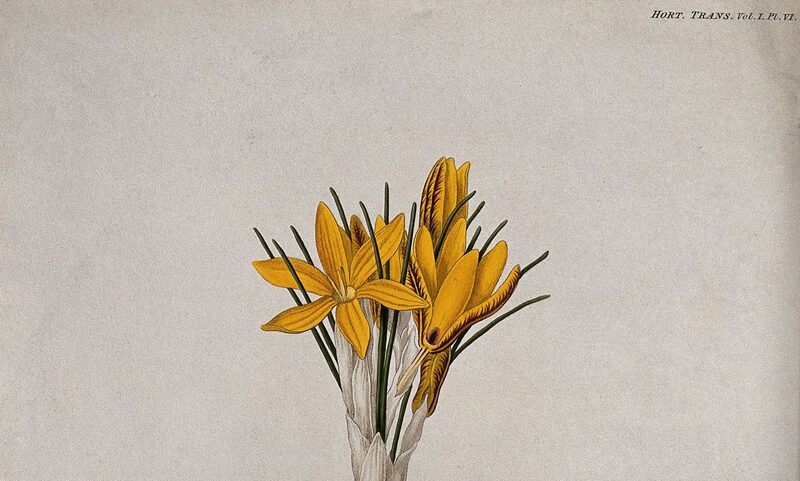 On the upside, tilling the land, breeding animals, cutting down trees, draining fens, building canals, mining the earth, manufacturing goods and transporting them for commerce—all this labor, along with the consumption and excretion of food, renewed the mixtures that nature constantly unraveled. Multiplied by the millions, local actions caused ripples: rain, winds, and waves to which Castel attributed weather pattern and climate change. When well concerted, human efforts made the earth compliant; when excessive or deficient, corrective backlashes ensued — storms, earthquakes, volcanic eruptions. On the whole, the world remained hospitable because man-made mixtures, combined with nature’s weighing and sorting action, preserved the planet’s internal circulation mechanism. Carried down by rivers, oceanic currents, and subterranean channels, the by-products of human activity fueled the central fire of the earth, the reservoir of heat for all living beings on the surface. Castel estimated that the sun only contributed a minute portion of heat compared to the earth’s inner furnace, hence the importance of keeping it alive. Fifty years after Castel published his treatise, Georges-Louis Leclerc, Comte de Buffon (1707-1788) hypothesized that the earth was once a globe of molten rocks, whose age he ingeniously estimated by measuring the cooling rate of molten metal spheres. Revisiting the notion of a “central fire” keeping the planet warm from within, Buffon warned his readers about the inevitable freezing of the world, but also suggested that human industry might counter the process. Framed by debates about climate, gravity, progress, and the place of divine and human agency in nature, the Enlightenment saw scores of new ideas about the history of the earth — some of which presaging in surprising ways today’s anxieties about climate change. Yet Castel his contemporaries also expressed more confidence in human stewardship. Humans were God’s special ingredient in a perfectly well-balanced recipe; their 19th- and 20th-century successors would not be so serene. Richard, Jean-Olivier. “The Art of Making Rain and Fair Weather: Life and World System of Louis-Bertrand Castel, SJ (1688-1757).” Ph.D. dissertation. Baltimore, Johns Hopkins University, 2016. Castel, Louis-Bertrand. Traité de Physique sur la pesanteur universelle. Paris: Cailleau, 1724. Buffon, Georges Louis-Leclerc, Comte de. Les Époques de la nature. Paris: Imprimerie royale, 1780.